Did you know you can save serious cash by booking your train fares in advance? I had no idea, and I didn’t know that the price differences could be so much. Compare a ticket bought Edinburgh to London is £125.80 on the day, but if bought in advance it’s only £25.80 that’s a saving of literally £100 for the same fare. It’s unbelievable! If you’re traveling with friends, a partner, or even as a family, think of the savings over two, or three tickets. It can really add up. I love to travel as much as possible to see new places and to visit friends, so knowing that I can save so much on train travel by booking 10 weeks in advance, means that I’ll be able to take more trips, while saving money overall. If you travel by train, or are planning any trips in future, then you need to check out this helpful infographic. 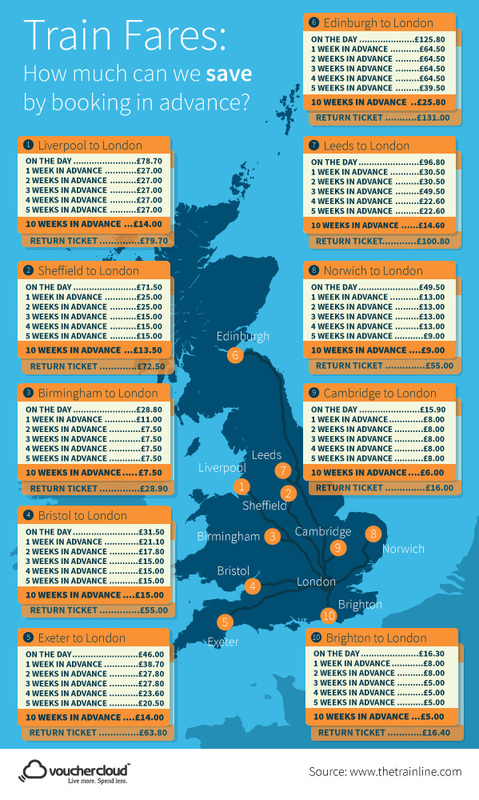 The team over at Voucher Cloud have made a great infographic on Train Fares: How Much You Can Save With Advance Train Fares. Check it out below and get inspired to save money on your next business trip or holiday!